'Tis the season for tastings apparently! Here's info on both of these free events since they're occurring within the same week - next week! Tickets may be purchased online or at the event: $5 for each individual tasting, or a five tasting ticket package for $20. Buy or Will Call tickets at Dupont Circle Resource Center (9 Dupont Circle) beginning at 5 pm. FYI, this is not an outdoor tasting with booths, street closings, etc. The tastings are provided within each establishment. Lupe Cantina - Taquito, Quesadilla, or Frozen Margarita. Taste of Dupont After Party with $5 Margartias. Proceeds benefit Georgetown Ministry Center's services supporting the homeless. One tasting ticket is good for one tasting. Also enjoy a Tasting Pavilion for Wine, Ale, Spirits ($10 for four tasting tickets), and live music. The bf and I haven't had Tex Mex (he likes to call it Texican) food in a while, so we decided to check out Guapo's since a friend recommended it. We've seen it many times driving by since it has an entrance on Wisconsin Ave and Woodmont Ave. There is metered street parking on Wisconsin and a metered garage across from the entrance on Woodmont Ave. The closest metro stop is Bethesda on the red line. The restaurant is LITERALLY part of the Double Tree hotel. See the hotel rooms? You can see the swimming pool and rooms if you enter from Woodmont Ave, which we did. The entrance from Wisconsin Ave looks like a house! On your way to the main dining room is their sun room area for dining. This place is huge! You could never tell from the outside. There is another room for the bar area and another whole dining room. The decor is simple but warm. 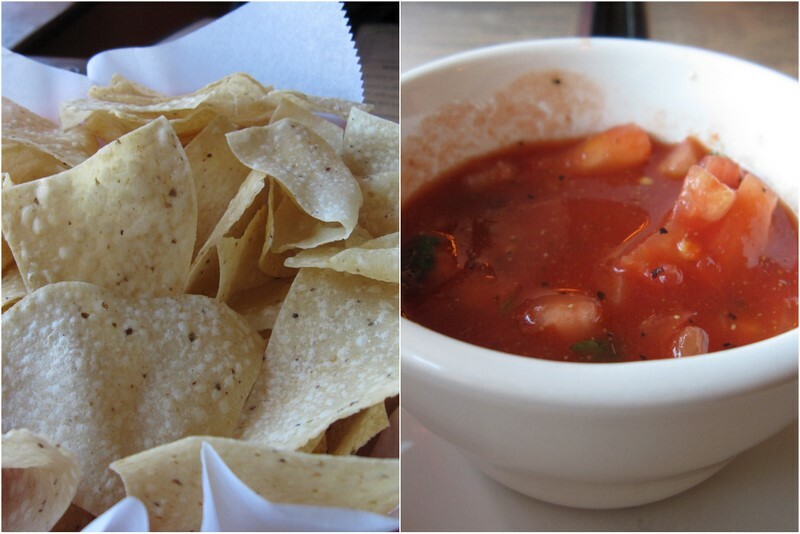 I love fresh chips and salsa. The homemade salsa is chunkier than most I've tried at other restaurants. The bf ordered the 'Combination Fajitas (Steak & Chicken with Mexican butter, guacamole, lettuce, pico de gallo, and sour cream)' for $15.95. It was a lot of food! He enjoyed it a lot because the meats were tender and flavorful. He wasn't sure what to do with the Mexican butter, so he didn't use it. 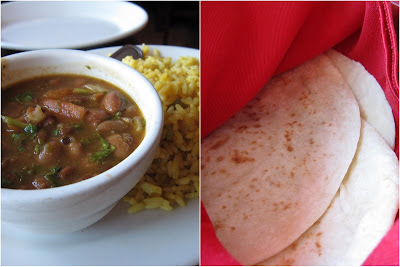 Mexican rice, a la charra beans and tortillas also came with the Combination Fajitas. I ordered the 'Guapo's Combinations (Beef Enchilada, Chicken Tamal with Mexican rice, refried beans, guacamole, sour cream and pico de gallo)' for $10.95. You could actually see the meat and the sauces weren't too heavy. It was a delicious dish, though I thought the tamal was a bit mushier than I prefer. We had a good time there as the food came out fast and the staff was nice. We found the food to be tasty, and maybe only a tiny step better than other local Tex-Mex places we've tried because nothing was overly greasy and appeared fresh. Our dinner was at a random hour, hence the empty dining room picture. Plenty of space for large parties of people. For weekday lunch, this location offers AYCE buffet 11:30am-2pm. Finally a place where all of the Food Trucks I've wanted to try (but haven't been able to catch) are going to be! There's also going to be music, art, classes, performances, etc. Admission is Free! 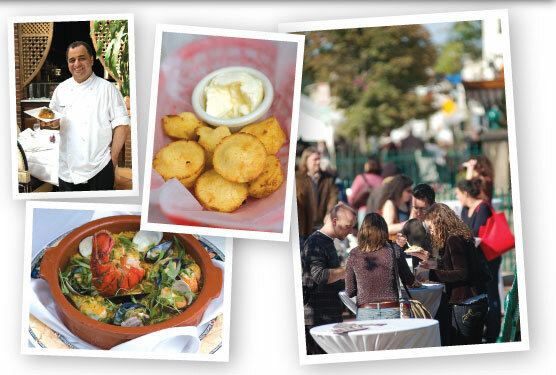 DCRA, in partnership with the DC Commission on the Arts and Humanities , Downtown BID and Brightest Young Things, is hosting DC’s first annual Curbside Cookoff on October 7 – 8 from 11am to 9pm at the Old Convention Center parking lot (11th & H St NW). I'm SOOOOOOO excited! I've linked all of their Twitter pages in case you wanted to catch them before the event. After DCFBHH at Poste, Michele from Squirrels-n-Sweets accompanied me to get some more food at Chinatown's trendy dim sum spot Ping Pong Dim Sum. There is street and garage parking in the vicinity. The closest metro stop is Gallery Place-Chinatown on the red/green line. Sorry this pic is blurry! (One too many HH drinks at Poste). The interior is beautiful with dark (almost black) cherry wood floor and tables. There are a good number of tables, full bar area, and dim sum bar counter. Very modern and sophisticated feel. This was 9:30pm on a Wednesday and the place was packed! Traditional images of dim sum include carts of food being pushed around, but those are not present here. It's more like 'tapas' where you choose off of a menu, and fill out a sheet of paper with the quantity of each item you want to order. We ended up not being that hungry after sitting down, but check out the few items we did get. 'Chicken puff (Honey roasted barbecue chicken in hand made puff pastry topped with pineapple)' for $5. This was my favorite. The puff pastry was flaky and light. The pineapple brought a nice sweetness to the tender filling. I could eat 10 of those. 'Char sui bun (Honey barbecued pork in a fluffy white bun)' for $6. We chose this item because Michele has given one of her friends this nickname. It was also a bit sweeter than a typical pork bun because of the honey. The filling was also very tender and the outside was very soft. We also ordered the 'pork shu mai (pork and king prawns in an open pastry topped with a Chinese wolfberry)' for $5 because we wanted to see what wolfberry was. I don't remember it tasting like anything. This was good and not as salty as I've had it other places. Overall the food was yummy, and the items we ordered had a little twist to the traditional flavors, but nothing shocking. Our server was very helpful and nice, and the items came out quickly. They do warn that items arrive as they are made, in case you're wondering where the rest of your order went. The menu has a large variety of items to choose from, though they are more expensive than any other dim sum place I've tried. The atmosphere is fun, and a great place to shares lots of plates with friends and down some speciality cocktails. Food Buzz Challenge #1: Ready, Set, Blog! Hi Everyone! I'm entering a contest called Project Food Blog where every week for the next 12 weeks there will be a new blog post challenge. Almost 1900 people have entered, and only 400 will be chosen by a panel of judges for the next round. After 10 rounds/challenges, the winner gets $10,000. Can't hurt to try, right? Challenge #1: What defines you as a food blogger and makes it clear why you think you have what it takes to be the next food blog star? My blog is an extension of my life through food. You can see my upbringing, hobbies, friends, love life and travels in my posts. Both of my parents are Vietnamese and as a young child my mom said I ate everything. Growing up in a Vietnamese household and attending family gatherings, food was made to feed an army! I was fortunate enough to grow up eating ethnic food, which has allowed me to have a more adventurous palate as an adult. Born and raised in Maryland baby! Non-MDers do NOT understand sitting for 3-4 hours picking at blue crabs, but its one of my favorite things to do. Living right outside of such a diverse city as DC, I've been able to try so many different types of cuisines like Ethiopian, Burmese, Turkish, etc. If you've been a true follower of my blog, you will know that blogging is not my only hobby. Breaking has been a HUGE part of my life. It'll be 10 years in a few months, and it has allowed me to meet so many different people and travel. Traveling and having friends in different parts of the country has allowed me to experience new cities like a local, which is the best way to try their cuisine. "The Bf" (as he's referred to on my blog) is the #1 person I've been eating with for almost 6 years now. We are complete opposites when it comes to interests and tastes. He loves buffets, meat, fries - manly food, and that exposes me to even more places I wouldn't normally choose. Part 2: Why you think you have what it takes to be the next food blog star? I am passionate about food and enjoy blogging about restaurants, recipes, food events and having others use me as a reference. I'm not blogging for myself - this is for others. The content of my blog is mostly DC area related but does offer material for people everywhere. For years I've been snapping pics of my food (photo: Vietnam 2006) before I even knew what blogging was. I love photography, so posting them on a blog seemed like a natural progression. When I blog about restaurants I want my photos and comments to feel like I'm a friend telling you about last night's dinner. My writing is fairly informal and I prefer it that way. When I'm out of town, I like to recap where I ate in case someone happens to be out of town looking for a recommendation. As far as I can remember, I've loved baking. I've been able to try some great recipes and share them with my readers. I have a crazy sweet tooth and have probably gained 10 lbs because of this blog. I don't cook as often as I eat out, but I'm learning and improving the more I do it. Sharing my cooking mistakes, step-by-step photo directions, and tips I've learned along the way can help a novice cook feel more comfortable in the kitchen. I think I'm the next "food blog star" because my blog has a little bit of everything. It is an easy read with a lot of pictures that talk for themselves, and I'm doing all of this because I truly enjoy it. It's the year of DC! Real Housewives of DC, Real World DC, Top Chef DC....so let's bring the next Food Blog Star win to DC! If you feel like voting, please click on the HEART towards the top of the voting page, thanks! CSN Stores has kindly offered to give one of my lucky readers $55 to spend on their site. They offer access to over 200 online stores where you can find everything from coffee table to fantastic fitness equipment to cookware. -Leave your name and email address in the comment box. -Deadline is Sunday, Sept. 19th 11:55PM. The winner will be chosen at random and announced Monday, Sept. 20th and CSN Stores will email the winner the gift certificate code. Happy 1 year Anniversary to the DC Food Blogger Happy Hour! Granted, this was my 2nd one, but it has been awesome eating and drinking with people who love food as much as I do. September's DCFBHH was at Poste Moderne Brasserie in Penn Quarter. The closest metro stop being Gallery Place-Chinatown on the green/red line. The name comes from being in the original 1841 General Post Office, and their modern cuisine promotes sustainability and eco-friendly practices. This is the entrance to the restaurant, which we didn't get to check out since we were in their garden. The atmosphere is so relaxing considering you're in the middle of the city, but you can't hear any of the traffic. I was able to meet a bunch of new people, those who's blogs I've been following for a while, and other food blogger friends! Their happy hour menu was very small and simple. $5 glasses of pinot noir or chardonnay. I preferred the pinot noir. Apparently there was a cookie give-away and I won! Free food for a foodie?! I felt like I had won the lottery. An entire cake box filled with 2 dozen HUGE cookies from Northside Social in Arlington. Thanks guys! I didn't want to be a total oinker, so I hope the other food bloggers enjoyed eating them too. Cute place to get away in the city, and who doesn't love wine and truffle fries? Great having funny convos with you guys, and seeing old faces again: squirrelsnsweets, iflipforfood, gregslistdc, dclovesfood, dcwrappeddates, johnnaknowsgoodfood, girlmeetsfood. Recently, my friend invited about 14 of us to get brunch at American restaurant Founding Farmers for her birthday. Located three blocks from the White house, there is street parking and hourly garage parking (one block away). The closest metro stop are Farragut West and Foggy Bottom on the blue and orange lines. This is DC's first Certified LEED restaurant. That means the restaurant's architecture and interior have been constructed and created with a minimum impact on the environment. They also purchase ingredients from family farms, compost, recycle, and practice other methods of being "green". I wasn't able to check out the top floor but the 1st floor could fit a lot of people. This 2-level restaurant has a modern-colonial look. The high ceilings, large windows and "slabs of tree" tables were casual but refined. They gave our bustling group a few pitchers/bottles of water (how cute! 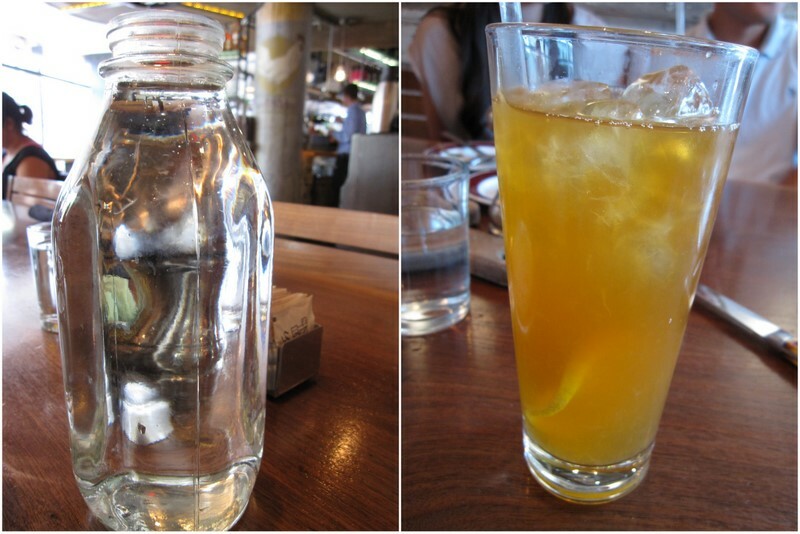 ), and the bf ordered an 'Arnold Palmer (iced tea and lemonade)' for $3. Since this drink is made to order, they didn't offer free refills like some other drinks. I wish they did though because it was refreshing. Our table shared some orders of deviled eggs. Top: Devil-ish Eggs: The Classic (A Platter of Our Traditional Deviled Eggs with the Classic Filling) for $4. Who doesn't love deviled eggs? 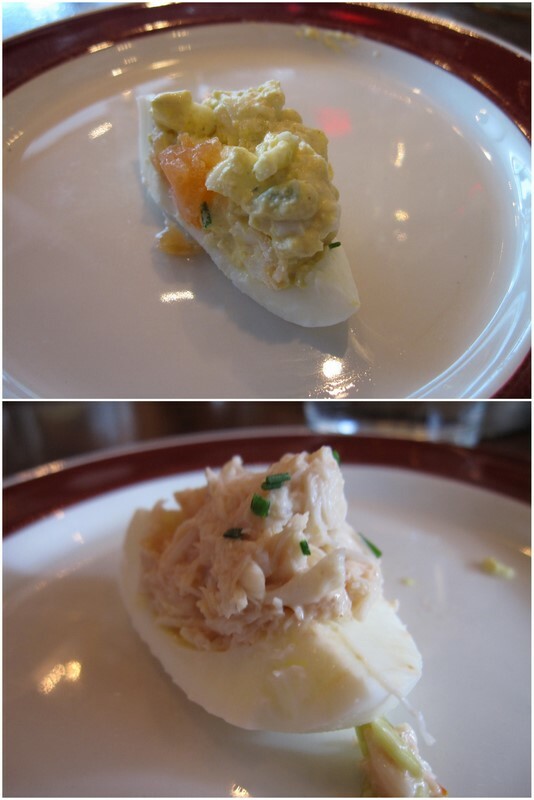 Bottom: Devil-ish Eggs: The Combo (Our Classic Devil-ish Eggs, with Maine Lobster, Gulf Crab, and Salmon) for $14. I found these to be overly salty. This was a little less than 1/2 our table. Lots of people and food crammed onto one table! I'll be mentioning some other people's dishes so you can see what they look like. My cousin ordered the 'Eggs Benedicts with Crab (Two Soft Poached Eggs on House-Made English Muffin. Served Leek Hash Browns)' for $13. She found the dish to be somewhat soggy, and lacked bold flavors. She also didn't finish the leek hash browns. Overall, she said it was ok. The birthday girl ordered 'Southern Pan Fried Chicken (Crispy Fried Free-Range Chicken with Gravy and Waffles. Served with Mac’m'Cheese and Today’s Vegetable) for $16. This dish came off of the lunch/dinner menu, so the portions were huge! She found the fried chicken to be non-greasy, and the green beans cooked perfectly. The mac & cheese was a bit overcooked and bland. The bf ordered 'Fried Chicken, Eggs and Waffles (Crispy-Fried Free-Range Chicken Tenders with Gravy, Two Eggs Any Way and a Golden Waffle with Whipped Farm Butter) for $12. I felt bad because he wanted to order the item above, but I pointed this out on the brunch menu thinking it was the same for cheaper. Nope! These are chicken tenders and apparently I can't read when I'm hungry. He thought the chicken tenders were better than ones you get at the bar and he actually liked the waffle even though he's not a pancake/waffle kind of guy. He ordered this dish because he wanted to relive our visit to Roscoe's in LA. 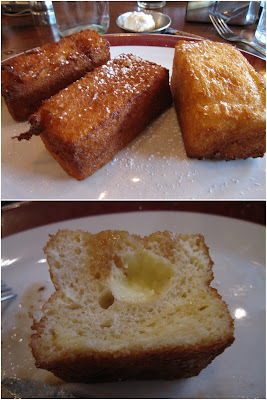 I ordered the 'New Orleans Style Stuffed French Toast (House-Made Brioche Soaked in Brandy Creme Anglaise, Flash Fried and Filled with Vanilla Pastry Cream with Maple Cinnamon Syrup) for $8. They looked like mini bricks of fried dough. Only one of them had filling, so they weren't as special. It tasted more like a dessert and though I enjoyed it, it wasn't what I was expecting. Look at the cake her boyfriend surprised her with! A giant red velvet cupcake cake from Just Cakes in Bethesda. It's so adorable! I love red velvet, but I think this cake might have become a bit dry because it was picked up a few days prior. A pic of all the ladies! We had such a large table of people, so at times food and drinks were coming out slow but that's understandable. The atmosphere makes it a cool place to eat with friends. The food was average/normal because no one said their dishes was spectacular or horrible. The prices are kind of high for breakfast food, but they offer large portions. It's always nice to support a place that is environmentally conscious (hippie at heart) and they offer around 8 vegan-friendly dishes too. 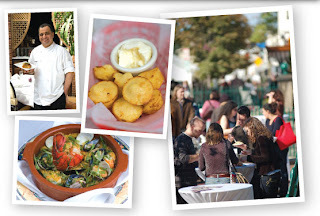 4th Annual Taste of Friendship Heights, Saturday, September 25th! WHERE: Friendship Heights Village Center, 4433 South Park Avenue, Chevy Chase, MD. Organized by the Friendship Heights Urban Network (FHUN) and the Village of Friendship Heights, the Taste of Friendship Heights will showcase some of the area's premier restaurants, including Capitol Grille, Indique Heights, M Cafe, Famoso, Bambule, Lia's, Maggiano's, Frosting Cupcakery, Potomac Pizza, Tynan Coffee and Tea, Whole Foods, Courtyard Marriott and Sunrise Brighton Gardens. Food and drink tickets are $5 for 4 tickets. A portion of the proceeds from the event will be donated to a local charity, the Community Council for the Homeless at Friendship Place.